Technology moves fast. What once was new can quickly become old and outdated. Although we redesigned and launched a new website in 2012, by 2014 it no longer fit our users’ needs. In September 2012, only 12 percent of the people visiting our website did so on a mobile device. By September 2013, almost 25 percent were mobile users — a 102 percent increase in just 12 months! Each year we see a steady increase in the number of mobile users. On average, about 35 percent of our visitors are on their mobile device. To keep up with demand, we decided to redesign our website and make it mobile-friendly. That means our site will re-adjust the content to fit the size of any device, whether it is a desktop computer, a smart phone, a tablet, or something else. Define your audience — who needs to know what? 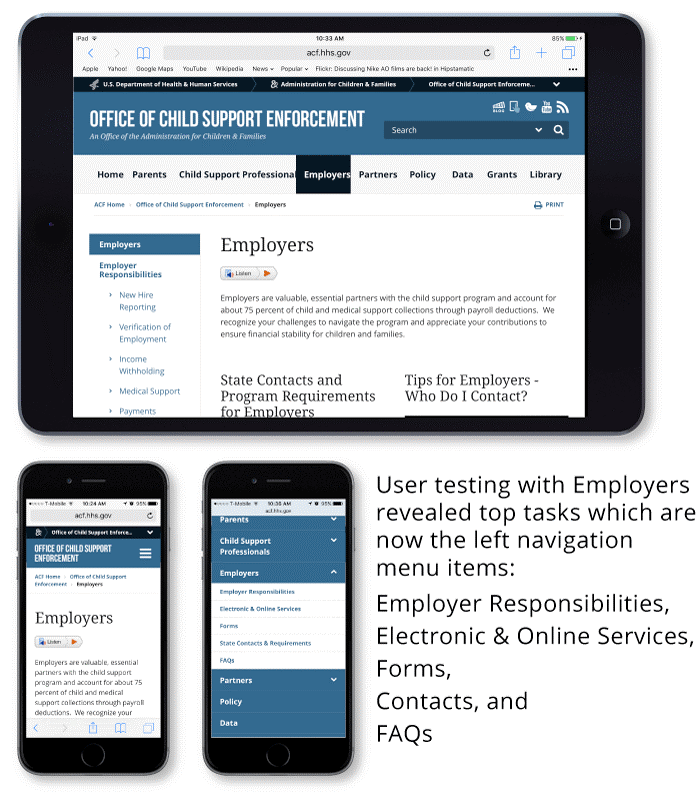 Our site must meet the needs of a variety of audiences: from parents to child support professionals, employers, and other partners; all groups need accurate information specific to them. Identify top tasks — why are people visiting our site and what do they need? To answer these questions, we went to frequent website visitors. User testing with employers gave us insight into why you visit our website and how you navigate it. Based on feedback, we organized the main menus and submenus to accommodate your top tasks. As more people visit websites using mobile platforms and as technology moves forward, you will see more updates and refinements. If you’d like to help test our site or have suggestions for improvements, contact Tristan Anderson at tristan.anderson@acf.hhs.gov.